Thanks to Mike Barraclough for spotting this interesting blog post from journalist David Boyle. He's been researching into how (what later became) the BBC World Service got access to Bush House in the first place. Noel Newsome was one of the most extraordinary broadcasters of the century. The BBC never forgave him, kicked him out after the war and never mention his name in the official histories of the period. He is a reminder that, the great days of BBC broadcasting - the voice of freedom from London broadcasting to occupied Europe - was actually done outside BBC control. Kirkpatrick also saw his role as allowing Newsome to do what he wanted, pioneering his own form of propaganda at the BBC, which was primarily about culture, history and getting the truth out first. But the part of his job which lasted longest was finding Bush House, which had been built as the headquarters for the American advertising agency J. Walter Thompson, and which Kirkpatrick managed to requisition within a few days of his new role. The European Service was then based at the former ice-skating rink in Delaware Road, Maida Vale, which had a glass roof. So Newsome's assistant Alan Bullock (the future historian) was sent as an advance party to their new headquarters at Bush House. It was not a moment too soon: the Delaware Road studios took a direct hit a few weeks later. More on David's site and in his amusing book on the rise and fall of British Empire brands. Well worth reading. I still have a mystery that I would like to solve. I'm curious why Newsome was seconded as Chief of the radio section of the Psychological Warfare Division of the Supreme HQ Allied Expeditionary Forces in October 1944 while apparently still working for the BBC. May be someone knows? Also, I realise that one of the first documentaries I made on Radio Oranje is relevant. It explains the relationship between the BBC and the government's in exile. This was actually my first attempt at making a mini radio documentary, being 23 at the time. Joined Radio Netherlands (Radio Nederland as it was then called) the year before. In July 1981 I got an interview with the late Professor Lou de Jong (he died in 2005), who worked at Radio Oranje in London during the war. Alongside the BBC Dutch Service broadcasts, there was time allotted to governments in exile. Before doing the interview, I did quite a bit of research into what happened at the offices in Stratton Street. Lou de Jong was a bit stiff and stern to start with. He was testing me to see if I had really done my homework or just wanted a sound clip for something else. I told him I was fascinated in broadcasting history and really wanted to find out what it was like to be a broadcaster in those difficult times, especially working for the Dutch government in exile. So he began to really enjoy telling the story, even though it must have been for the hundredth time. The Dutch government had a 15 minute slot in which they could beam their message back to occupied Holland, but also, as it turned out by looking at the schedule, to the Dutch East and West Indies. The entire scripts of the transmissions were in the archives of Radio Netherlands building (since the station grew into Radio Netherlands in 1947) before being donated to the National Archies. The original programme was broadcast in two parts, which explains the strange length. More details on the Dutch Institute for War Documentation is here. Listen to the radio documentary here. Is local radio suffering from mergers and networking (i.e. more simulcasting). Trevor Dann, former chief executive of the Radio Academy, believes there has been a failure to regulate the local radio landscape "on a scale to match the banking crisis". I think he's spot on. There is a dearth of local content on many of the stations I monitor. There's not much local left in local radio. Clever technology can add local station IDs and commercials, but there is not content. 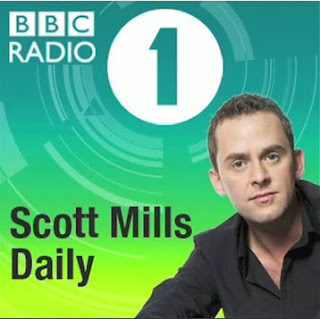 Speaking to the Today programme today, he said that local stations were gradually becoming "not radio stations but relay stations of playlists and DJs making programmes in London". His comments come as the Office of Fair Trading looks at the takeover by the biggest commercial radio group in the country, Global Radio, of the Guardian Media Group's radio interests, for £70 million. Independent radio consultant Grant Goddard told Jim Naughtie in BBC Radio 4 the commercial sector has become "increasingly emerged into larger and larger companies", and "listeners to radio in local areas particularly simply don't have as much choice as they used to." Interview is here. Trevor is also the person behind much better use of radio archives. This reminds me of early Apple ads which claimed their software was so easy even the managing director could use it. When the local retailer tried to sell us a newsroom system based on hypercard using one of these ads, I told them they had 20 minutes to leave the building otherwise I was going to call security. Never been so disappointed in Apple. First they mess up Final Cut 10, now this trend which is to appify everything, even platforms that are not designed to be driven by a touch screen. This new ad (and others in the same series) don't work because these are not real problems that people are trying to solve - and the deadline is silly. If you were trying to finish a brilliant keynote would you take your Mac into an Apple Store and head of the genius bar? And have you ever seen a genius in that blue t-shirt outside an Apple Store? I bet you haven't. I'd google the question and get an answer much faster. Failed campaign. That's it. BBC Radio 4 newsreader Zeb Soanes cycles to BBC Broadcasting House. Uses a Go-Pro and records comments on his way to work. Recognised one of the spots used in the last year's great film Tinker Taylor Soldier Spy. UPDATE (29 July): After discussion, the IOC and the BBC have agreed that there is no need to block our international streams of Radio 4 programmes with a wide news agenda. Radio 5 Live (apart from the news programme Up All Night) and 5 Live Olympics Extra will remain available only in the UK. The Chris Evans Breakfast Show on Radio 2 will also now be available internationally. Radio 5 Live Sports Extra coverage of non Olympic Sports will be available as normal. I note in the more than 100 complaints on the BBC Editor's blog that BBC Radio Scotland was also banned from the Interwebs during news programmes. Wonder if the message has got North of the border? And the on-demand episodes of PM don't work here in the Netherlands. So the decision doesn't seem to affect what's already gone out. What took them so long?? Twiplomacy is the first-ever global study of world leaders on Twitter. I do recall at a Le Web conference 2010 in Paris that Matthias Luefkens of the World Economic Forum did a short intervention on the same subject. And again at a TEDx conference. (I see Matthias mentions them in his Twitter profile. Turns out he is a lead author in the project). But Twipolomacy turns out to be a more comprehensive survey that Matthias's presentation above.. The governments of almost two-thirds of the 193 UN member countries have a presence on Twitter: 45% of the 264 accounts analysed are personal accounts of heads of state and government, but just 30 world leaders tweet themselves and very few on a regular basis. "This study shows that while the social network invites direct interaction between users, few world leaders take advantage of this opportunity to develop connections. Almost half of world leader accounts analysed don’t follow any of their peers. A quarter of world leaders and governments follow President Barack Obama and the White House, but @BarackObama and the @WhiteHouse have established mutual Twitter relations with only three other world leaders: Norway’s Jens Stoltenberg, the UK Prime Minister and Russia’s Dmitry Medvedev." The Dutch government doesn't use Twitter for a conversation but rather as a broadcast PR tool. It's well down at the bottom of the league table, despite relatively high usage of Twitter by the Dutch. Caretaker Dutch Prime Minister Mark Rutte has an institutional account also maintained by the Rijksvoorlichtingsdienst, the government information service. The account has well over 100,000 followers including the @EU_Commission, Herman van Rompuy @euHvR, Portuguese President @prCavacoSilva, but is not following anyone, not even the Dutch Royal family @KHtweets. By ignoring his peers the Dutch Premier is cutting himself out of the conversation on Twitter. According to the account’s description, “every message will be read but not (instantly) responded to. For questions to the PM, go to our website”. Although the account has never sent a single @reply, Mark Rutte does answer the most asked questions in a weekly video. The tweets sent by the Prime Minister’s office are mainly official announcements about upcoming press conferences, his daily schedule and government decisions. The Moscow times website added some interesting commentary on July 27th referring to the same report. The report said "Medvedev is one of the most connected world leaders," noting that he subscribes to Twitter messages from seven other heads of state or government, who in turn subscribe to, or "follow," him on Twitter. By comparison, U.S. President Barack Obama follows only two other world leaders, Medvedev and Norwegian Prime Minister Jens Stoltenberg. Burson-Marsteller collected and analyzed the material for its report earlier this month. Medvedev also is one of the most popular government chiefs on Twitter, a publicly available Web service in which users send comments and Web links in messages called "tweets" consisting of 140 characters or less. As of Thursday, Medvedev had more than 1.3 million followers, making him one of a dozen governmental leaders or their offices with more than a million followers. Displaying similar popularity on Twitter are the presidents of Argentina and Brazil and the prime minister of Turkey. Obama is No. 1, with more than 17 million followers. As president, Medvedev in June 2010 set up the Russian government's first Twitter account. He did so while at Twitter's headquarters in San Francisco, a milestone that happened during his Silicon Valley tour and complemented his modernization push. He opened the account with the handle @KremlinRussia but now uses @MedvedevRussia as his personal account. Reminds me of Layar, except that it has a story. So it's more interesting. One of the best short films done by students that I have seen in a long time. Hope they get to complete it. Excellent article showing (to me) that a lot of the sponsors money at the Olympics is wasted. Consumers Don't Really Know Who Sponsors the Olympics | Global News - Advertising Age: "Marketers spend hundreds of millions of dollars around their Olympic sponsorships, but consumers often don't appear to be aware of who has paid to attach their name to the games. Worse yet, they often think that honor belongs to a major rival. In an online survey of 1,034 U.S. consumers last week, 37% of respondents identified Nike as an Olympic sponsor, and just 24% said, correctly, that Adidas is one. That may be partly due to Nike's success in identifying its brands with serious athletes of all types. Nike is also a master of ambush marketing, breaking a global campaign today -- the opening day of the Olympic Games in London -- that features ordinary athletes competing around the world in places outside England that happen to be called London. The campaign, from Wieden & Kennedy, is called "Find Your Greatness." Coca-Cola was cited by 47% of respondents as an Olympic sponsor, more than any other brand, but 28% incorrectly believed that Pepsi is a sponsor." Ghost Radio: Playing to an audience of one? I have found my own personal classical music station. RNW announced that it was closing the RNW Classical channel at the end of May 2012. But it is July 28th and it is still there...playing nonstop classical music into cyberspace. Jackie Spears is presenting it here. It's the station they forgot to switch off. The promos for other programmes in 10 languages is rather eery, as most have now gone away. But it's a rather pleasant selection while it lasts. I guess someone will simply yank it off the air, so don't expect a formal closedown. So how do you reach Dutch citizens on Bonaire, Curacao and Aruba with live Olympics coverage? Can't use a satellite service like BVN because everyone can see this as it's unencrypted. So the NOS. Dutch public broadcasting, built a dedicated geo-targeted video stream , though with only 11 people watching after the opening ceremony, not sure that many have found it. Buried on the website, that's why. Brilliant ambush marketing by Nike. The Olympic organising committee doesn't know how to share the Olympic spirit, displaying a very poor understanding of social interaction on the web. Someone should change the Alan Smith loop to explain that the rights issues are for the duration of the Olympics and give the reason. They could have done a much better job of this....if they can bleep words out on local radio phone ins (by putting the programme into a 7 second delay, they could do the same with PM and the world at one. Meanwhile Guardian says its Olympics ‎"video is available in UK only". Really? Perfect here in the Netherlands. Thank god for the BBC Radio 4 World at One Podcast. 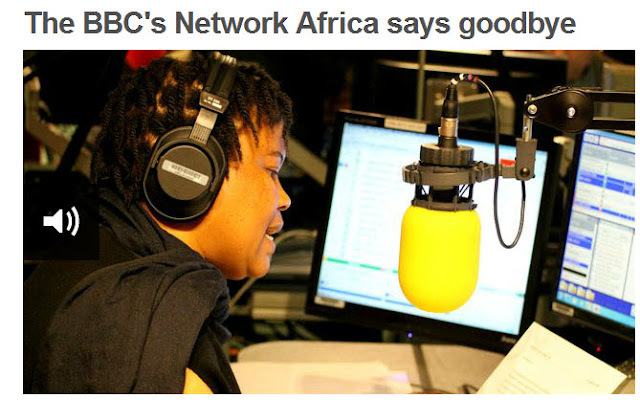 This parody rather reminds me of the new format of BBC Newsday on BBC World Service. Sadly it fails to impress at all. Replace the word elections with Olympics and it sounds very similar. Except that its television on radio. The title for the new show - Newsday - is spot on. Unfortunately it sounds like Newshour dragged out to fill half a day on air. It might work on TV - as it is at the moment it sounds like BBC's Breakfast Time mixed with World Have Your Say and Grandstand. Coming live from the market didn't add anything except background noise and those eating their breakfast at that time of the morning had nothing to add to the conversation. It was so relaxed as to be meaningless. At that time of the morning I'm looking for a briefing, If I want gossip, or to see breaking news, there's TV. Neither of these formats work on the radio - they annoy the older listeners and they don't reach the younger demographics who are far more attuned to TV/video. So if this was the answer, what on earth was the problem? The World Today and Network Africa were too expensive as independent productions. But now we have a regional morning programme that's trying to be an evening show in North America. It reminds me of the BBC 648 trilingual experiments to Europe which didn't work because there was no thread to the programme that anyone could follow. It sounded interesting to non German/French speakers - extremely repetitive to those that did. I must say I have a dejavu experience when you check the Wikipedia entry for Up to the Hour. I remember that disaster when I still at school. Up to the Hour was a programme on BBC Radio 4 that ran from 1977 to 1978. There were two editions each weekday morning, each approximately 30 minutes long and finishing at 7am and 8am respectively. Both parts were followed by the Today programme, which during this period was also broadcast in two parts. The original theme tune was Tambourin by François Joseph Gossec, performed by James Galway. In 1977 the then-controller of Radio 4, Ian McIntyre, cut the length of a number of news and current affairs programmes, in the belief that this would improve their overall quality. In the case of the breakfast programme Today, the reduction from two hours to one was achieved by splitting the programme into two. The gaps created were filled by Up to the Hour, which consisted of lighter items such as music, sport and trailers for upcoming programmes. It also incorporated the existing religious slot, Thought for the Day. The new format was unpopular with BBC staff, including announcer Peter Donaldson who on at least one occasion openly ridiculed the programme on air. It also provoked comments in the diary columns of the daily newspapers. By the end of 1978 Today had returned to its previous length and Up to the Hour had been dropped. I wonder what the reaction from the partner stations will be, who have carried Network Africa up until now? How does adding input from Johannesburg add to a coherent storythread? I don't feel drawn into the conversation because, frankly, I'm not in the mood for a phone in show at that time of the morning. There was a sign outside Bush House that said that "audiences are at the heart of everything we do". If Newsday is to survive it has to refocus and rethink the information need of the audience it is trying to serve. One conclusion might be that trying to serve two audiences like this is Mission Impossible. They could take a leaf out of the presentation styles of PM and the World at One on BBC Radio 4, and/or peaktime programming on Radio 5. This was also an unfortunate week to launch bearing in mind that because of rights restrictions there is no on-demand version of this marathon show available until August 13th when you-know-what is over. I'll dip in now and then to check. I know it takes time for any programme to settle in. But I will also explore alternatives. This is what you get if you take three production CDs that I used in the Media Network studio from 1995-2000 and fire them off one by one. It turns into 85 minutes of nostalgia with the daft jingles and promos we made to parody international broadcasting in the nineties. Ised the Dalet Workstation to make most of these - because it was the only way to do multirack mixes at Radio Netherlands. Before that we made jingles in the studio using complicated mixes of bit of tapes spliced together using razor blades. Was it efficient? No. Was it fun. Yes. So how will the BBC Sports cover the Olympics online? The answer is in this presentation given at the excellent Hack The Newsroom conference at the Global Editor's Network news summit. Unfortunately the coverage of the conference is a bit hap=hazard, excellent in parts but not in the editing of the first day. This part of the meeting was held in the basement of the Hotel de Ville building (Paris Mayor's Office) and consisted of rapid fire presentations by various broadcasters and publishers. 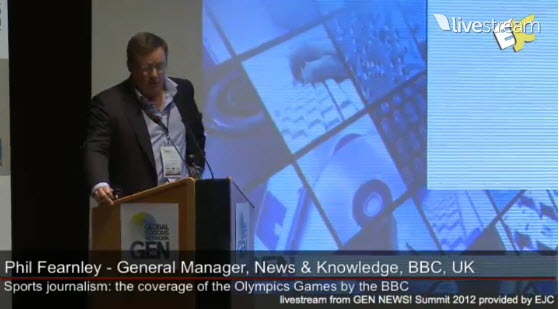 Phil Fearnley, General Manager News & Knowledge, BBC Future Media & Technology (and also manager of the Digital Olympics coverage), gave an interesting albeit brief overview of how they have used the Olympics to build a better online presence for the BBC. The video is the entire afternoon session, so you'll have to fast track to 39' minutes 16" seconds where Phil starts his presentation looking at how in this Olympics the audience (in the UK) will be in control.There were also some issues with the sound half way through. He also goes into some detail about the technology they have built. The heart of the strategy is live video. The BBC says it has experience with previous large events and believes there won't be a meltdown later this week. 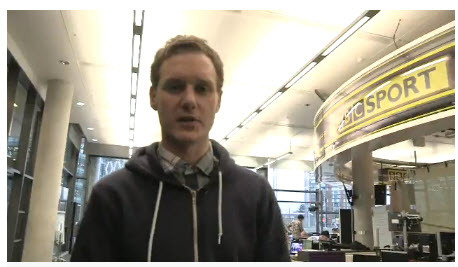 The BBC site also has a tour of the BBC Sport's new home in Salford. Found this after following a link on James Cridland's excellent blog. What a thoughtful piece by Trevor Dann about radio archives. He gave it at the great NextRad.io conference last year, but I see it hasn't had the reach it deserves. It's true that there seems to be paradox in radio that there is a love of playing old records but the speech in between has to be contemporary...the latest news and weather. Putting old speech clips out is seen as less important than having a fresh new statement that no-one has yet heard. Most radio archives across Europe are in a rather sorry state. The tapes may be physically in bad condition. More often than not it;s the catalogue that is incomplete, so you can't find stuff. Then the fastest way to get something done is to the find someone and ring them up rather than digging out the context yourself.. So because it takes too much time to find things (Youtube is often faster) I see many broadcasters wondering what to do next - and whether they should be keeping all this stuff. Rooms full of tapes have been chucked out on the grounds that no-one is interested. Yet when you work out what it has cost to make this material, the cost of making a coherent collection pales by comparison. As an aside, I remember calculating that at Radio Netherlands we were putting about 9 million Euros worth of material into the radio archive each year - without a real plan of why we doing this. I'm glad we did. The archive is infact provides access to Dutch society in foreign languages for the second part of the 20th century. Now that the RNW building is going to be cleared for new tenant, I wonder what will happen to that archive. But back to Trevor Dann. He discusses the idea of a Peoples' Archive, where the public broadcaster (in the case the BBC) would declare an amnesty on the tapes recorded at home by listeners and announce what they were looking for to complete their own archives. There is a time element here. Cassettes and home-burned CD's don't last more than a couple of decades, especially if they are not stored under the right conditions (too hot or too much sunlight). I note that some of the CD's I made in 1995 are becoming unplayable on computer's though they still seem to work on CD players. Trveor's point that using the archive is generally frowned upon by station management is true. Repeating a programme was often seen as a lazy way out of a scheduling problem, yet a scheduled repeat of something makes a lot of sense and audiences like it. I have been releasing time travel editions of Media Network, a show I used to produce and present on Radio Netherlands. They are left, as broadcast, so you can understand the context of what is being said. But there is clearly a market for dipping into this kind of archive and putting ideas from the past into a modern context in order to have a serious discussion about the future. I note that the excellent series that Trevor has produced on the Sounds of the 20th Century has a page on BBC Radio 2'website - but it could be so much more. Update: Trevor kindly responded with an update this morning: You’ll be pleased to know that the People’s Archive, now re-named The Listeners’ Archive, will be launched shortly as part of the BBC’s 90th anniversary celebrations. The announcement will be made after the Olympics. Lessons Learned: We need to start thinking about more creative uses of archive material. History has a horrible habit of repeating itself. The media, in general, is poor at putting discussions of the past into a useful modern context. Now that search technologies are improving, creative use of archives needs a rethink. I see that a report by the activist group Witness has had some effect, at least on YouTube. 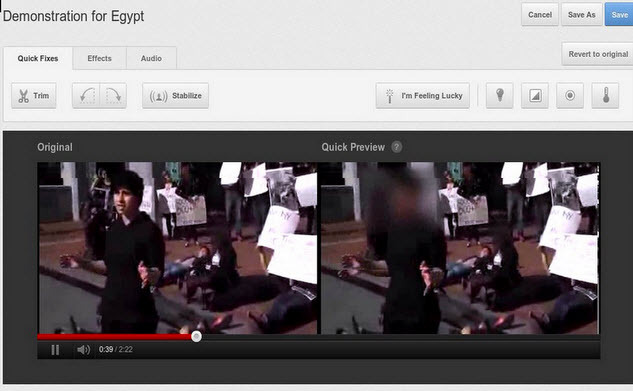 They announced recently that their platform now allows you to blur faces before you upload the video. That's useful because authorities in the Middle East and China are going after protestors. But the software needs to be refined so that not all faces are blurred. At least, you need to have a choice. The other challenge is that it makes it harder from organisations like Storyify to verify the authenticity of the footage. But then the original is still around, so maybe the problem doesn't exist. I'm afraid I had to give up on the hackers and founders meeting in Cafe de Doffer on Runstraat, Amsterdam a week or so ago. Interesting speaker but the venue in a bar in Amsterdam had no functioning air-conditioning and just awful acoustics. My feeling is that either you organise a speaker in a fairly decent surroundings or just make it into a meet and greet. Pity. The International Broadcasting Convention has its own portal and awards scheme, but it fails to update its own details. The promotional material on this page is all from 2011, which makes me wonder whether I'm the only reader. 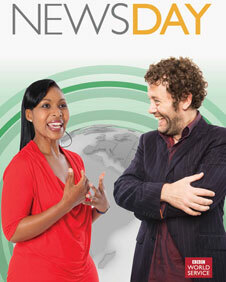 BBC is cancelling its morning show BBC Network Africa today, launching a new programme on Monday called Newsday. It will try to combine Africa and US distribution. There will be co-presentation of the programme from Johannesburg. Curious how this will work since the programme has to serve audiences in North America listening late at night and African audiences listening in the morning. Curious. Not sure how the BBC can sanction this sort of commercial deal. I'm sure they will point to the fact that Scott is a freelance presenter, but he is very much the face of a public broadcaster. I doubt that 5 minutes of "exclusive" content is going to be the cornerstone of any Samsung marketing success. But its more the principle for me. I see that the Open Democracy movement in the UK has opened a special website to make the BBC more accountable to the public. It has some interesting points for debate, although I believe the fact that one of the sponsors is the Liberal Conspiracy will lead to charges that it has a political left agenda. the article by journalist Claire Bolderson shares the fear that many World Service staff have that the recent downsizing of the station means that its future is much less secure. It's not clear though what we need to do to Fight for the World Service. 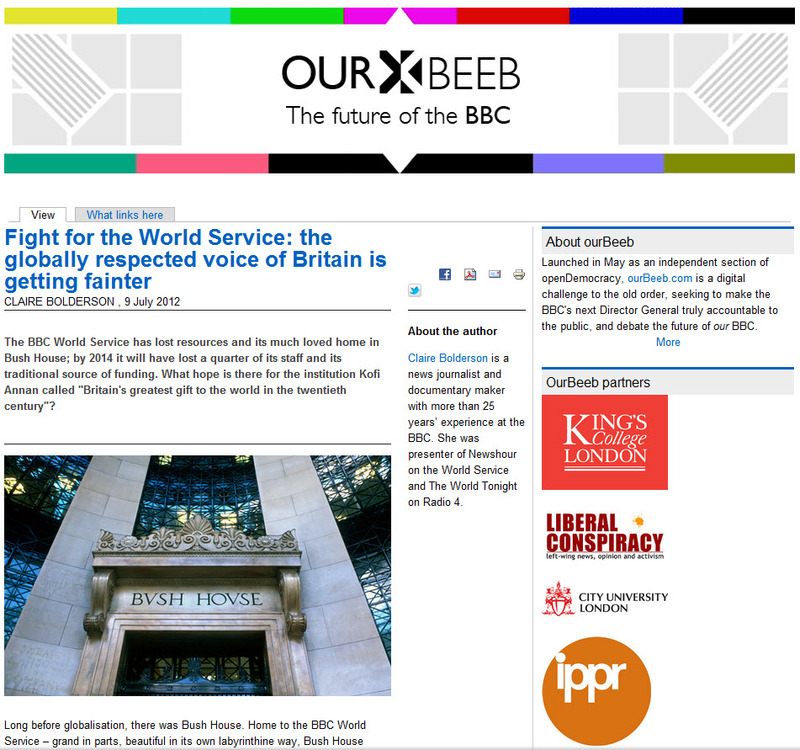 I believe BBC World Service is right to pursue a cross-media strategy making a relevant mix of radio, TV, online and mobile if it wants to maintain influence in certain parts of the world. I hope that the radio will complement the TV offering, since radio is so much better for analysis and discussion - content drives form, whereas TV is always form driving content. I dip in and out of BBC WS rather than listen for long periods as I used to - repeat cycles are much higher and the programme range doesn't match BBC Radio 4. I find feature programmes like Click! on the radio have suffered since the integration with TV versions in a way that could easily have been avoided. There was a battle for budgets and TV clearly won. I find that the uncut podcast versions are better than what is squeezed in on air. 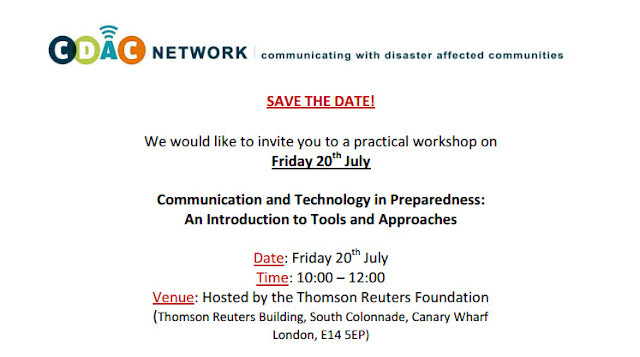 There's a conference in London tomorrow about media and natural disasters. Mike Adams, who has done a lot of work in this field forwarded me this video of work his organisation has been doing in Indonesia with radio in a suitcase projects. Deserves a wider audience. Mike got back to me to explain about a new project he is working on at First Response Radio. After the 2004 Tsunami and 2005 Pakistan quake I was part of a group that has developed a team to provide emergency radio in disasters. We call our network of partners FIRST Response Radio. Teams are trained and have the KIT already in Indonesia, India, Philippines and Singapore. We are expanding more each year. I am also encouraged to see UN backing and many NGO's getting on board with the idea. The most active group is called CDAC which stands for Communicating with Disaster Affected Communities. Just today I posted a press release about the Indian team which is responding to the Assam Floods in the NE. They flew in with their "studio in a suitcase" and made programs in Assam, then broadcast them back in via shortwave radio. In other countries (Indonesia & Philippines) we will bring in an FM transmitter in a suitcase as well. Our experience shows us that a trained team can have the FM station on the air in well under 1 hour from arriving at an emergency location. I was sorry to read that the RNW radio-in-a-box program will be coming to and end with the cuts. 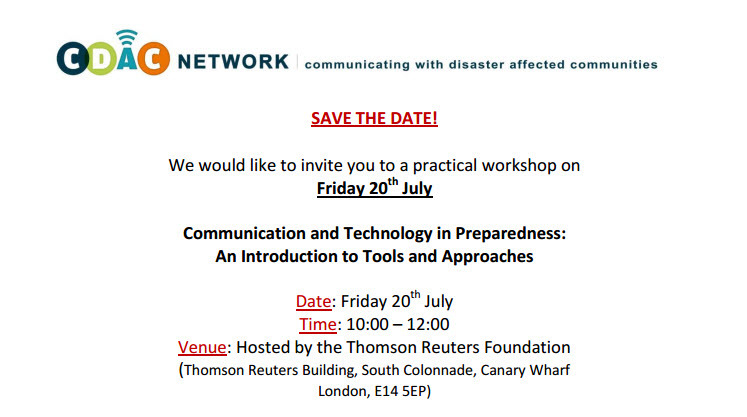 That's one fewer orgs involved in using radio in disaster. My overall assessment would be that there is a core group that has been steadily working to get radio into the place in needs to be - at the center of disaster response work. I agree. 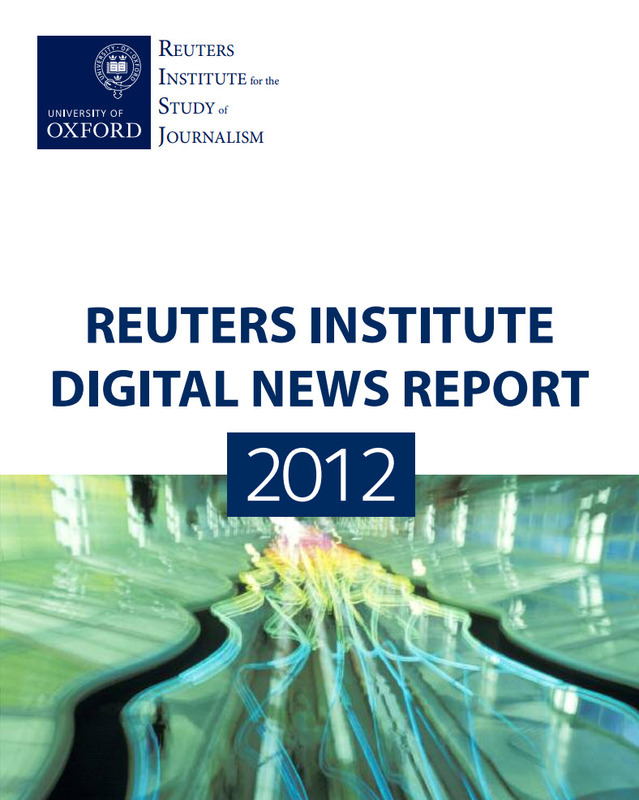 Traditional media when combined with social media is the strongest case. Just look at these recent lessons learned from a resident of Florida, USA. Femke Herregraven is a Dutch designer who recently gave a presentation at www.curatingreality.nl, together with Siem Eikelenboom and Gaby de Groot. She was one of 8 groups that presented plans as a result of a 3 month workshop organised by the Sandberg Design Centre and the Netherlands Media Fund. I attended the presentation on June 7th. Femke presented a project called Taxodus, an online game where you're given so much money by your client and your task is to invest offshore for maximum profit. Note that the project has passed the project proposal phase, but has not yet been commissioned. Below is a Google translation of their Dutch text. At the moment the Taxodus website is in standby mode. Hope it become reality soon. Taxodus - Approximately 50% of world trade passes through tax havens and 83 of the 100 largest multinationals in the Netherlands for tax reasons. Flows seek the path of least resistance - but what are those roads in the year 2012? When we often think of tax havens with bank secrecy countries where celebrities mafiosi parking their money. British investigative journalist Nicholas Shaxson with his recent book, Treasure Islands, however, demonstrated that this offshore system not "exotic sideshow" but the very core of our global economy. They are the rich OECD countries like U.S., UK, Luxembourg, Ireland and the Netherlands are the largest players in the offshore system - they provide numerous opportunities for multinationals to escape financial regulation in their own country. Still, extent and impact of this offshore system long remained under the radar. Firstly because there is much discussion about the term 'tax haven' politically very sensitive. Secondly, because we only just snapshots of the offshore system see, there is little insight into its present geography. Taxodus is an online game that tries to bring change here. Based on existing data such as tax treaties and tax regimes between countries is a strategic landscape design. Players choose a multinational company or bank on whose behalf they attempt to evade the most tax. By using letterbox companies worldwide to set up business with banks as well as lobbying local politicians, the player lays bare the potential to escape financial regulation. The game is free to play, but at the end of every game played, the tax route taken using Taxodus is uploaded (anonymously) to the database. Firstly it acts as a database of the highest score which player has evaded taxes. 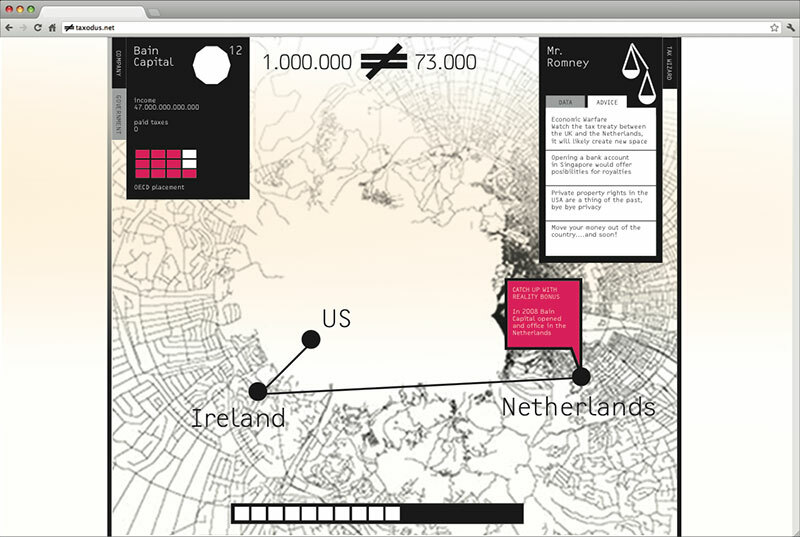 But it also acts as a public database of potential routes for each multinational. We think its a useful starting point for a journalist to investigate and verify what routes are really plausible and which not. The avoidance of taxes is not an exception but the norm. It has a powerful shadow economic system created that Shaxson omschijft as "the secret underpinnning for the political and financial power of Wall Street today". 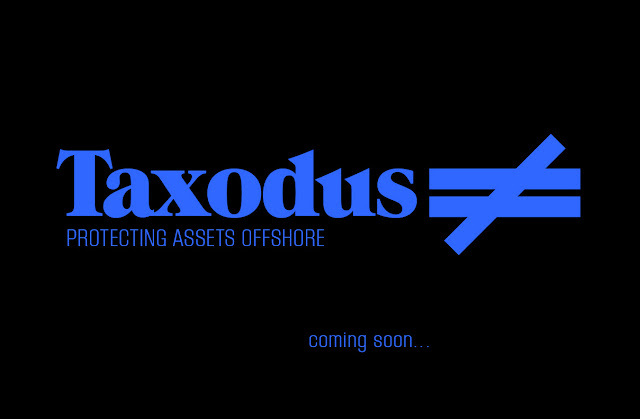 The purpose of Taxodus is connected by means of the crowd-sourcing this hidden offshore system and thus to give it a public face. This has become required viewing in my circle of friends. What happened to Storytelling in Hilversum? Hilversum Going Down The Tube? 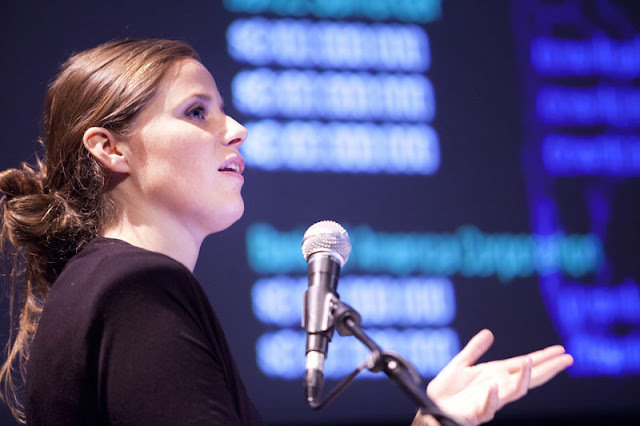 Reviewed the reports from this year's Media Congress in Hilversum. It's all about distribution and structure. The commercial TV sector is well represented - they are delivering audiences to advertisers in new and interesting ways. Lots of talk about consumers. Very little talk about citizens and society. The public sector is almost completely absent. Perhaps because they have lost the art of powerful storytelling? There is talent around, but it is seriously underfunded. And top leadership in disarray at the moment - truly horrible atmosphere. 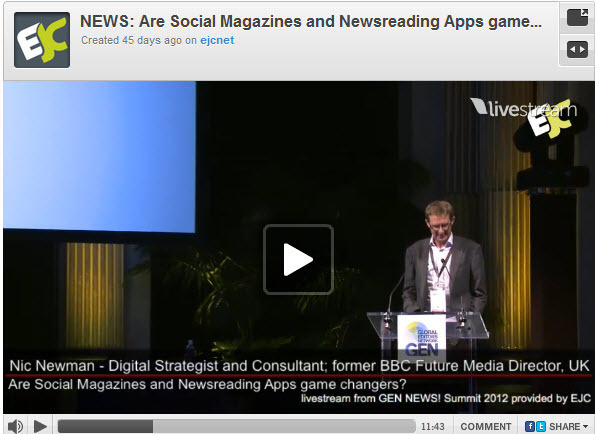 MPJC 2012: Videoquotes over Nederland internationaal from iMMovator on Vimeo. I'm afraid the quotes are in Dutch. Things are happening, but The Netherlands has lost its role as a experimental playground for innovative ideas. The cable companies are doing deals with catalogue owners, who often have much better content (foreign series) than currently being churned out in Hilversum. Discovered by accident that a Dutch design agency called Fabrique has come up with a handy guide to persuasive webdesign, making a handy fold out tool similar to a paint colour selector. Easier than a book to use and not expensive. 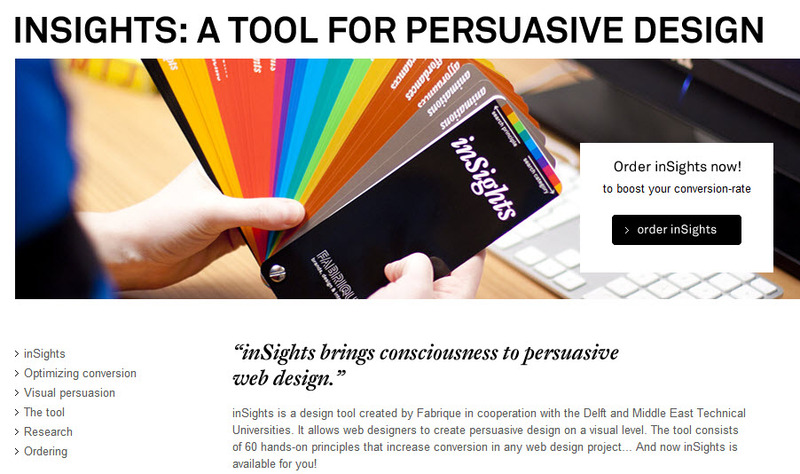 Fabrique over... inSights from Fabrique on Vimeo. Looking at my conference schedule for the coming months and realise it has changed radically. Out go the platform specific gatherings. For they are dealing with the past. Compare those with conferences like Storydrive in Frankfurt which are developing into meetings of the mind. It's not about the medium. It's the quality of the stories. Met the organiser of Storydrive, Holger Volland, when he was in the Netherlands last year. He had some very clever ideas which he is evidently putting into practice. 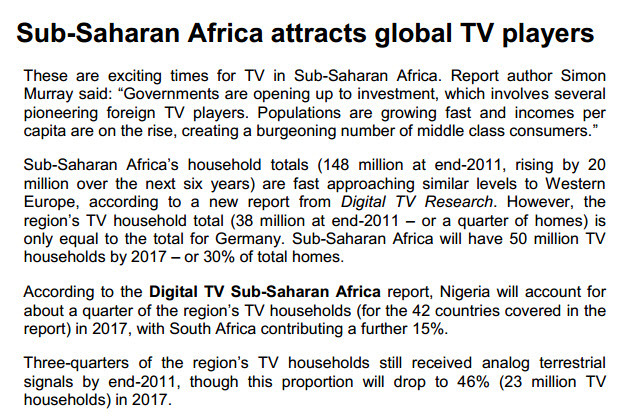 Had a phone call from someone looking for research into digital TV in Africa. Referred them to this report. Best one in a long time. Not free. But good value if you're seriously planning a TV campaign in that region. Lens Lice - Cutler's Comment on a growing problem! from Jonathan Marks on Vimeo. I remember good friend and colleague Jim Cutler telling me about Lens Lice while walking over the Rockefeller Plaza It seems others call them Photobombers. It is clearly silly season at WGN TV in Chicago ( a station I've visited in fact). Their reporter Pat Tomasulo recently took to the streets of Chicago and turned the tables on live shot interrupters or lens lice, asking them embarrassing questions on-air after they made their cameo. 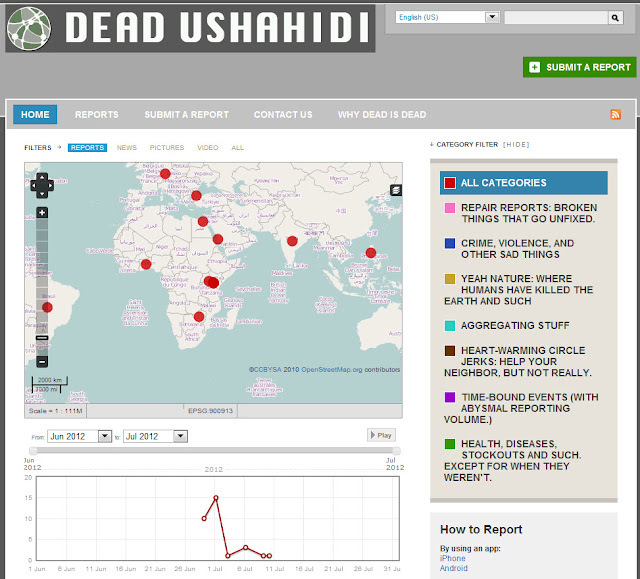 There was an excellent post a few days ago about dead data journalism, more specifically crowd sourced maps using Ushahidi software which are now ghost sites because they are not updated. They list 31. I get the impression there are a lot more. That's not a reflection on Ushahidi, the makers of the software. More on some of the people who use it. As a I mentioned in another post on radio, many of the NGO projects I've seen recently are great ideas but unsustainable business models. There are far too many experiments going on aimed at bringing short-term successes for donors rather than long term benefit to communities. There are also good ideas like the Building Bridges Peace Project which also had much more potential than was eventually achieved before funds ran out. Building Bridges in Nairobi, Kenya from Jonathan Marks on Vimeo. 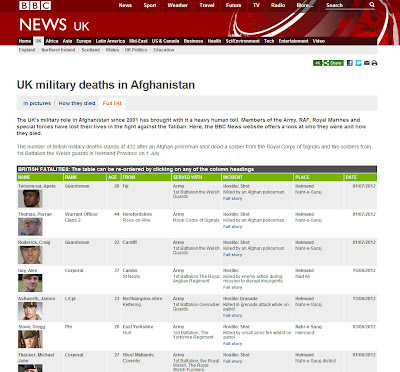 I have respect for some of the data journalism the BBC is doing because they're in it for the long term. 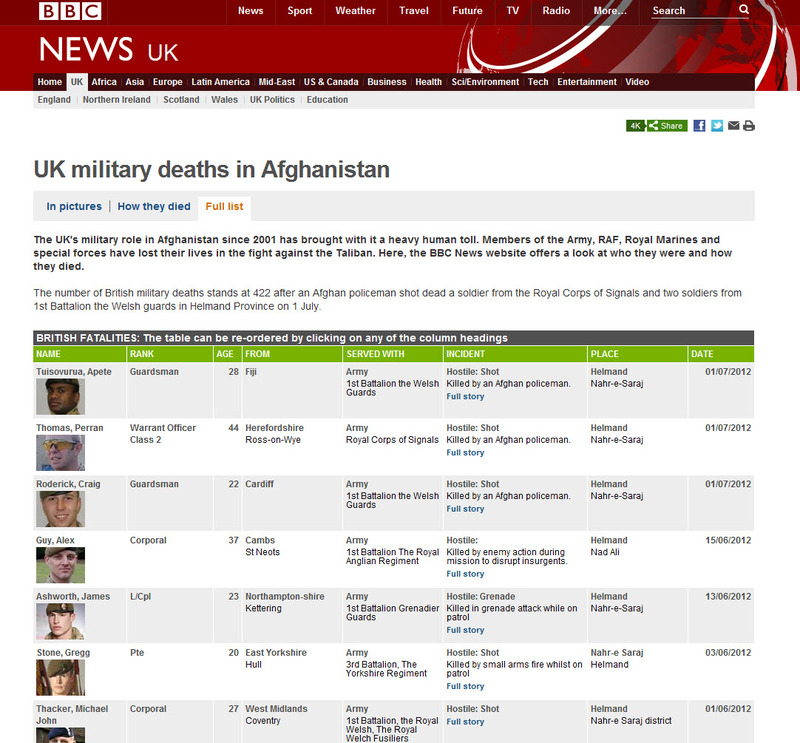 Like keeping track of British casualties in Afghanistan. But of course that's not the full picture of what's going on there. Don't suppose anyone is keeping track of that. Good article today on other forms of data journalism. In Paris, at the Global Editor's Network, Nic Newman gave a sneak preview the report he's been working on for Reuters Institute. The video is a bit tricky to locate and you'll have to skip through 12 minutes if you want to find this talk. I've worked with Nic in the past when he was at Radio Netherlands and have great respect for the work he did then and now. Check out his latest report. Grab a cup of coffee and quiet place. Does Sky Arabia just want to be efficient? But are they really listening? Happy Birthday Telestar - 50 today? RN Wereldomroep 3.0 : Are they serious?